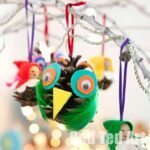 I am sometimes guilty of being too enthusiastic about crafts and making things, that can take a little more time to make. Not everyone has the time, nor the inclination. 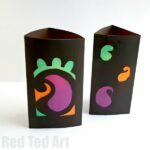 So here have a VERY quick and easy lantern for busy mum and dads (and aunties and uncles and carers). It will take 10-15min max and will look great! 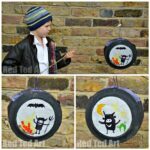 I love how this gives us an opportunity to introduce Germanic customs for our bilingual family and yet it still “fits” with British tradition – change the designs on the lantern and you have a fab decoration for Halloween! 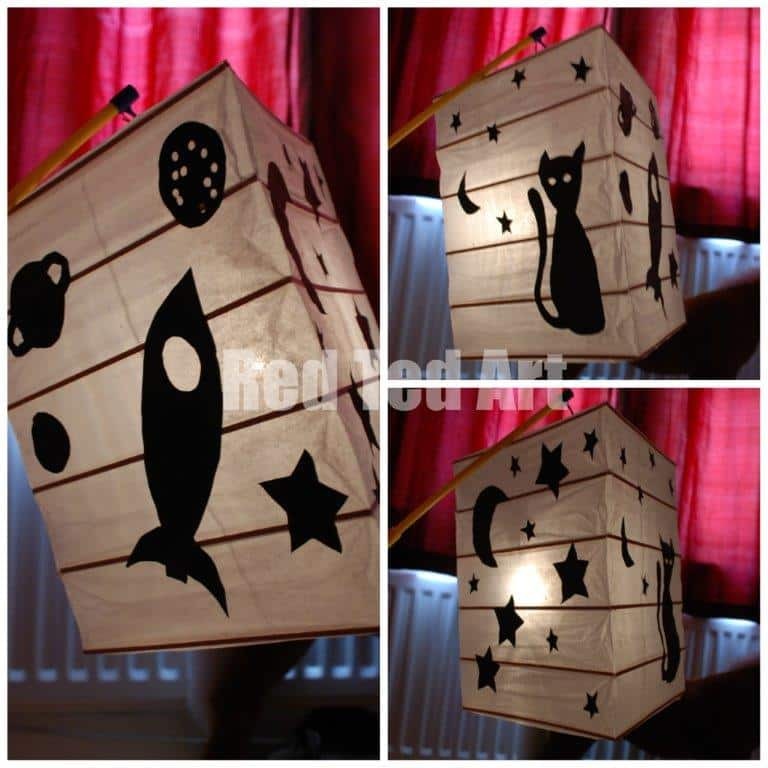 1) Choose a lantern shape – if you can find smaller ones, great, but the “big” ones look fab too. 2) Cut out simple shapes: we did stars, rockets, moon, cat. 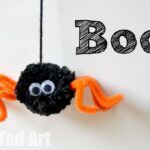 For Halloween, you can do a pumpkin, witch, cat etc. 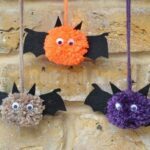 I haven’t had a chance to do some stencils for you, but Single Mummy has some cute In The Nightgarden ones here and a cat & jack o’lantern one here – go and take a look and make this craft super duper easy and effective! 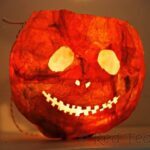 For more easy lantern ideas, go visit my fellow bloggy mum Mummy Do That. I would love to hear about your special family or country traditions – what do you do every year in Oct/ Nov?! Leave me comment and tell me all!! Oh they are fabulous, we’ll be doing these when we get back! Zoe – 🙂 love that! 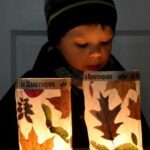 We do a small Lantern Walk with local German mums… but should that ever stop, we may just have to do the same as you guys!! Love it! Chris – have fun crafting! Thanks for sharing this with the Play Academy Maggy – it’s a great idea for a child’s bedroom lamp too. We observe Stir Up Sunday in Novemeber – baking our Christmas cake and making a wish as we stir it. Oooh, Stir Up Sunday sounds GREAT!! Love it!! Yes, was thinking of exactly the same thing – decorating lamp like this for Pip Squeak’s bedroom… maybe with tissue paper and butterflies?! Very cute! What a fun holiday too. We’ve been enjoying evening fall walks, maybe we’ll have to take a lantern with us next time. Oh, I like the idea of going for lovely walk and then having a lantern to brighten your day!! 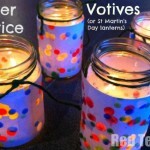 This looks great – but where can I get a lantern stick on a UK high street at short notice. Help please!! Aaaaah, there is a flaw to my “perfect” plan. I totally forgot the uneasiness of getting lantern sticks. Mmmmh. Let me get back to you, I am going to do a search…. Would an electronic Tea Light do the trick? beautiful! If I get time, I’ll also blog about the one we made this year, which is also very easy. We’re lucky, we have a large St Martin’s celebration in Glasgow thanks to a considerable number of German parents here, and they import the light sticks and sell them at the door for, yes, £1.50! Oh wow! Lucky you! I am in fact “importing” 12 for our playgroup!!! (i.e. one of the mothers is buying and them and bringing them over). Fabulous! Can’t wait to see your lantern! We are making another (even simpler one) at Playgroup this week! Yay! Hi! I love the song you posted through YouTube! Any idea who’s singing it and/or where I can get a copy?? They are called Kuh Katze and you can find them on http://www.kuhkatze.com/ I havent listened to any of their other things, but I would be interested to hear what they are like!! I can’t see the St Martinslied there, but maybe you can email them under their contact section? Love love love these! Can you tell me where you bought the lanterns? I’ve done quite a few searches for that particular color and no luck. Most of them are stark white. Please help! Thanks! I just looked on Amazon and they sell Lantern Sticks now.